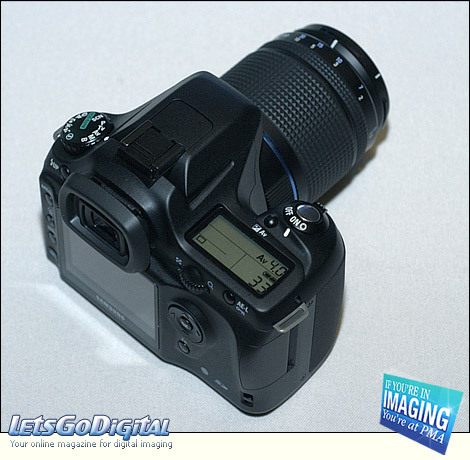 At the Sneak Peak, a day before the PMA 2006 begins, we run into the Samsung GX-1L digital SLR. Samsung presented their line of digital cameras to the world press, who is attending the International Convention & Trace Show. The latest product announcement is the Samsung GX 1L which is almost identical to the GX-1S model. The new Samsung GX 1L is a light weight dSLR model featuring a 6 Megapixel CCD sensor and incorporates the KAF mount. The Samsung GX 1L is therefore able to user many Pentax DSLR lenses and the whole range of KAF and KAF2 mount lenses. The Samsung GX-1L and GFX-1S cameras are Samsung's first dSLR products, obvious rebadge Pentax models, but expect a real Samsung around Photokina 2006! 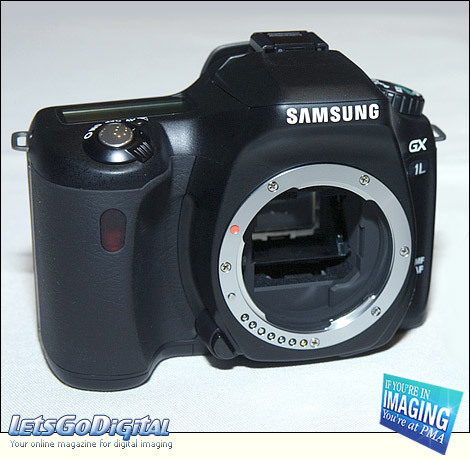 Samsung GX 1L - 6 Megapixel dSLR - Today the digital camera market is changing. There are several things different compared to last year. We find new players in the digital SLR market, like Samsung with its 6 Megapixel GX-1L dSRL camera, and we see well-known brands like Konica Minolta disappearing from the market. And it even seems that this is not the only brand that will leave the camera market in 2006! We welcome Samsung as an upcoming dSLR camera brand though, and hope to see more from them in the 2nd half of this year. Samsung GX-1L - D XENON lens - The new digital SLR camera from Samsung, GX-1L - features a Pentax KAF mount. Due to this type of mount the Samsung GX-1L supports all Pentax dSLR lenses. The Samsung GX-1L we got in our hands was equipped with the Samsung D-XENON 50 - 200mm f/4-5.6 lens. According to the official information Samsung gave us this new D-XENON lens was specially developed for the new Samsung digital SLR cameras. The tele-zoom lens is portable and light weight and features an image circle that will match the image sensor that is being used for the Samsung GX-1L camera. 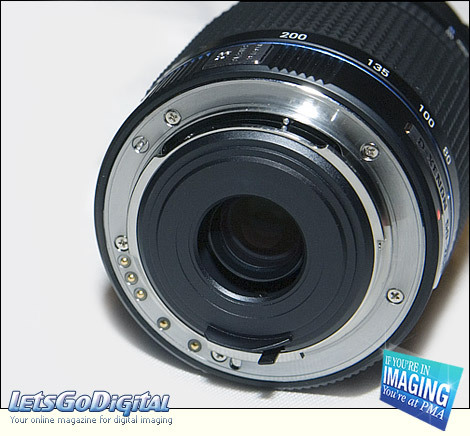 The focal length of the zoom lens is 50 - 200mm (equivalent to 76.5 - 306mm in 35mm format). The D-XENON tele-zoom lens incorporates ten groups and 11 elements and offers angle of view of 8.1º - 31.5º. The minimum focus distance is 1.1m offering a maximum magnification of 0.24x. The filter size of the D-XENON 50 - 200mm f/4-5.6 lens is 52mm and its dimensions 66.5 x 78.5mm with a weight of 255g. 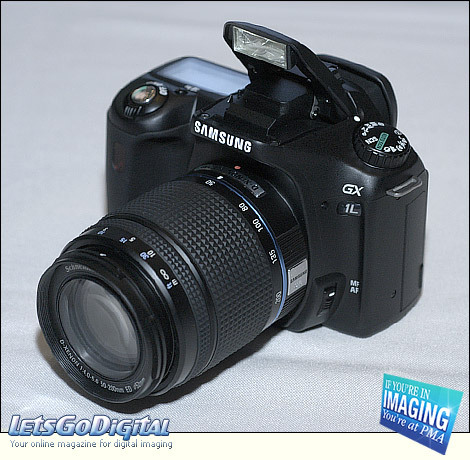 Samsung GX-1L DSLR camera - Scene - On top of the camera you will find a mode dial containing a variety of shooting modes. A large green AUTO SCN mode indicates the easiest way of shooting pictures and divides the mode dial in two sections: amateur and advanced settings. The amateur settings exist out of diverse scenes like portrait, landscape, macro, night and flash. Each of them giving the priority to certain shooting conditions the Samsung offers an easy way of getting into digital SLR photography. When in Auto Sensitivity mode the Samsung GX1L automatically selects the camera's sensitivity including brightness and focal length to help reduce camera shake and ensure a steady, clear image. Samsung GX 1L - Camera settings - Though targeted at the entry-level consumer the Samsung GX-1L digital SLR camera offers a wide variety of camera settings. First the camera offers a 5-point, wide area auto focus system for accurate focussing. This setting gives you the choice of using AF-single of continuous shooting. 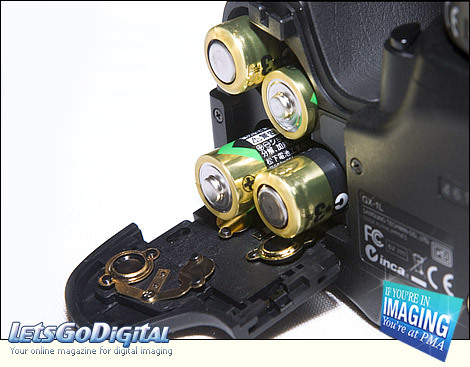 Furthermore the GX1L incorporates a three-mode metering system (center-weigthed, multi-pattern and spot metering) for various conditions. On the back of the camera we find a large 2.5-inch LCD monitor with a resolution of 210K pixels. Above the monitor is a bright pentaprism optical viewfinder offering 96% field view. Samsung GX-1L digital SLR - Secure Digital - Like the GX-1S, the Samsung GX 1L digital SLR camera incorporates a Secure Digital flash card slot. This tiny flash memory card is the standard format in today's digital compact camera and in some of the DSLR cameras. This type of memory card comes in a storage capacity up to 2GB divided into several speeds. The Samsung GX-1L is able to shoot at high-speed of up to 2.8 frames per second up to eight frames in JPEG shooting and up to five frames per second when shooting in RAW. Therefore it is recommendable to use a fast memory flash card. One of the fastest flash cards available is the SanDisk Extreme III card, but another interesting card to use in combination with the GX1L is the SanDisk SD Plus Ultra II card. This card, with the same standard size of a normal SD card, features a unique function: taking the card out of the Samsung GX-1L camera and literally bending it in the middle frees a USB interface. This way you can insert the card directly in a free USB port and get access to the captured photos and videos. Samsung and Pentax cooperation - Last year, around October, both companies declared their agreement of cooperating with each other. Pentax has a lot of knowledge to share with Samsung and Samsung is really dedicated to get the hard-to-get market share. Through combining their individual strengths and working together in synergy, Pentax and Samsung Techwin are devoted to supplying attractive digital camera products tailored to the needs of individual markets. With the introduction of the Samsung GX-1L and the Samsung GX-1S digital SLR cameras Samsung introduces themselves to the consumers. Photokina 2006 will be the place to be for brands like Samsung to fully penetrate into the digital camera market with more innovative products. Both of the DSLR cameras are a nice start, but it is very tough to get that market share. We will give Samsung some time, but it will take more than the rebadged Pentax digital SLR cameras to conquer any market share at all. It will be an interesting year.